There aren’t many things to look forward to in getting old – but Laser Masters sailing is definitely one of them. This was my first time sailing Florida Laser Masters week having just qualified a few months ago. The week consists of 3 events – Florida Masters in West Palm, Masters Midweek Madness in Sarasota and Masters Midwinters in Tampa. For over a decade now I’ve been running the Chesapeake Bay Laser Masters Regatta at Fishing Bay Yacht Club and so I was familiar with masters sailing in general. I’ve also traveled to numerous ILCA-NA events from ACC to Nationals to North Americans and was eager to try out Masters week. Unfortunately, my schedule would collude to only allow me to attend the first 2 of the 3 events. 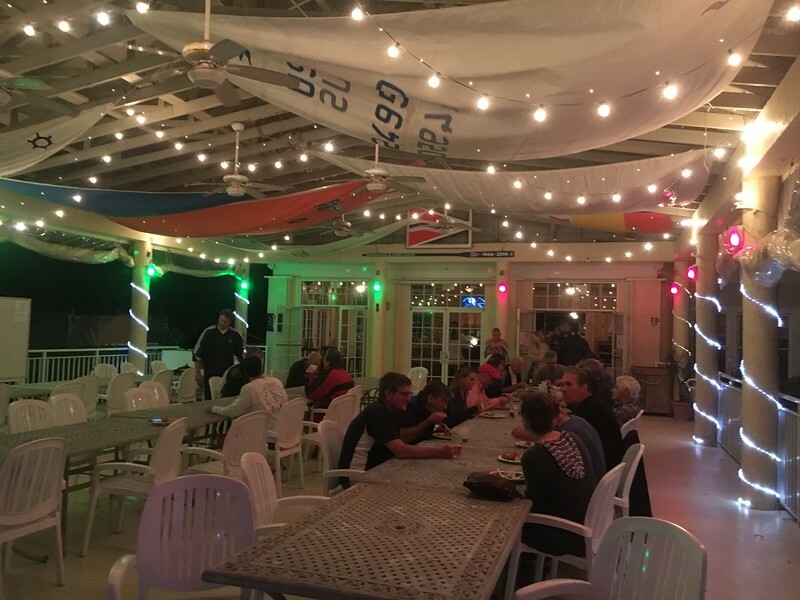 The first event this year was in West Palm Beach at Palm Beach Sailing club which is nestled in a residential neighborhood with some marine industry nearby. The clubhouse has a few rooms and a bar that opens out to an expansive pavilion deck. Between there and the water was room for rows and rows of boats to rig and be stored. 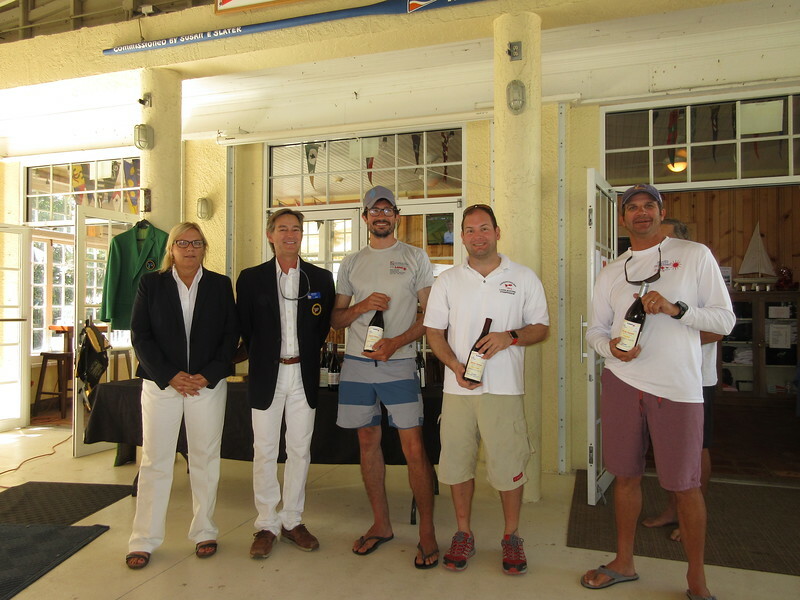 At the event were an incredible mix of sailors – some hitting the masters circuit for the first time – others having been to dozens and hailing from all across the US, Canada and beyond. Some drove in from Oregon and Colorado and parts of Canada – another group flew in from Brittan. I also found many of them had arrived a day early to practice before racing the following day. The racing at the Florida Masters took place out on the ocean – after a mile and a half sail down the channel and out to the ocean we were in a confused sea with large swells that would obstruct the view of other boats and the wind. With light winds 6-10 – everyone struggled to make the boat go. The shifty conditions especially in the first race made for a lot of passing lanes in picking the shifts right. Rob Hallawell was the most consistent on the day winning two of the races to lead. Carsten Steenberg, Dave Hiebert, Charlie Buckinghamand Roman Plutenko would round out the top 5 after 3 races. I managed 2nd in the Apprentice (35-45) division. With no wind forecast for Sunday the race committee wisely postponed on shore for an hour and then abandoned altogether once the forecast was proving to be true. Awards of bottles of wine were handed out to the winners of each age group in both Standard and Radial fleets. The awards ceremony also included a cool tradition of reading aloud all of the past winners. 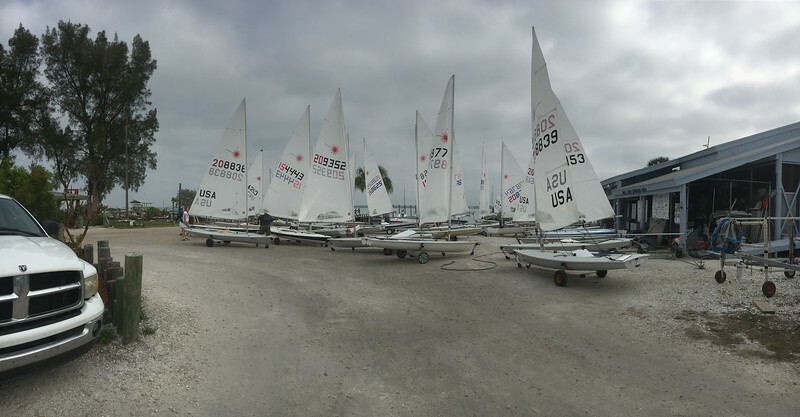 So with racing done early on Sunday and a day off Monday before sailing resumed on Tuesday in Sarasota – some hung around and spent the night in West Palm while others got on the road early. The trip from West Palm to Sarasota was a 3 hour trek across the middle of Florida farmland – I had never seen cows under palm trees before. In Sarasota on my first time driving over the causeway onto Lido Key I was struck by how pretty the water and the bay that would be the sailing area were. Sarasota Bay is a couple miles wide and surrounded on all sides providing protection from waves while having a lot of fetch for the wind. 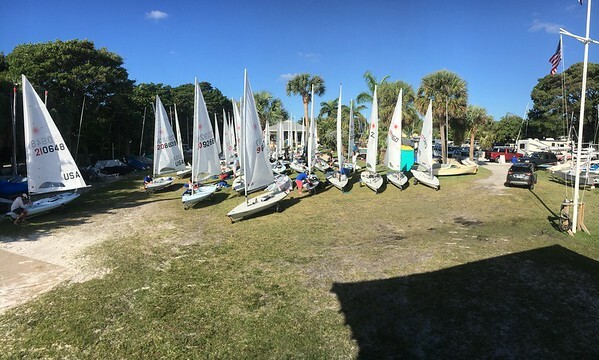 Sarasota Sailing Squadron was a monument to sailing in all of its forms. As a place that prides itself on being “The World’s Greatest Sailing Club” it’s home to a wide variety of sailboats ranging from dinghys to trailerable keelboats to some wild-looking 30+ foot catamarans. The club sits on a corner of a peninsula with water on 2 sides and plenty of access for launching Lasers along a wide beach. Racing got underway on Tuesday after a brief postponement – in overcast conditions with lighter air and very little chop. The usual big fleet tactics prevailed – those who got to clean air and picked a few shifts right generally did pretty well. With 3 races sailed the fleet retired late afternoon for fish fries and a couple kegs of beer. Wednesday saw the wind up in the mid-teens for the early part of racing and it cracking off just a little bit as the day progressed. Peter Vessella won 3 out of 4 races on Wednesday to win the overall followed by Tim Law and David Hiebert. I was bummed to miss Davis Island – but I had a great time meeting all the masters and spending most of a week in Florida and look forward to coming back next year!